Summer is here and this means a season full of outside dining. Whether you have a Master Chef situation, a little old-school charcoal grill, or even a tabletop barbecue, we have 10 quick tips for summer grilling cleaning. It's time to get the grill ready and keep it clean all summer. Check your grill for any broken or corroded parts. Since some parts may not be readily available, ordering online could be required. If you wait until the last minute, you could be waiting weeks. Using corroded and broken parts is neither safe for the user nor the food. 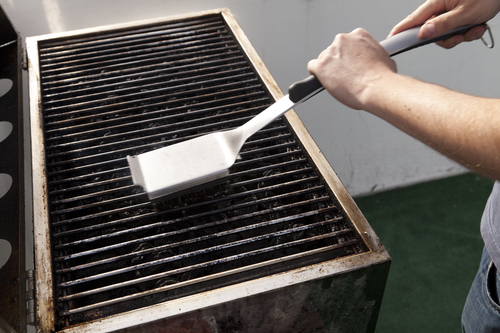 Use a sturdy, well-maintained, putty knife to clean the inside of your grill. Always scrape gently. Being aggressive will be damaging, but probably will not remove something quite stuck. If there is a bottom tray, remove the tray and brush the particles into a trash can. Clean the grids used for searing by soaking them in warm water and regular dish soap. When they have soaked and the grease and food are starting to loosen, use a wire brush made for barbecues to clean the rest. The grease tray has its name for a reason. Give it a very good scrape with an extremely sturdy spatula or a putty knife. Make sure to wipe it on paper towels, never run it into a sink. Rinse thoroughly. Grease cups are very inexpensive to replace. Less than $5.00 in most cases. If it is going to require 15 minutes of scrubbing and 5 gallons of water, just replace the grease cup. Make sure you do so BEFORE you start the grill. One of the most important parts of maintaining a grill is safety. Always do an inspection of the hoses and fittings. Use the soap test. For this test, mix one part water to one part dish soap in a spray bottle. Spray the mixture on all the fittings, MAKING SURE THE LID IS OPEN AND THE CONTROL KNOBS ARE OFF. Turn on the gas. ANY GROWING BUBBLES ARE THE SIGN OF A LEAK. Turn it off immediately and call for a repair person. If you have a tabletop or charcoal burning grill, make sure there are no holes where hot coals or fire can escape. Repair or replace it immediately as these are fire threats to humans and dwellings. The burner tubes need to be cleared of blockages. They can be caused by bugs, dirt, or just an accumulation of gunk. It can prevent the igniter from igniting or cause a fire. Brush the portholes using a stainless steel wire brush made for grills. Move it in an up and down motion, making sure not to go lengthwise across the ports. This action merely moves debris from one hole to another. Replace any damaged tubes. When cleaning any part of your grill, no matter what the style, only use a stainless steel brush made for grills. Use only dish soap and water to clean the grill. Food is prepped and cooked on these surfaces and any other chemical would be dangerous. Keeping the outside of a grill clean is a great challenge. Use an organic, food-safe degreaser for any parts on the outside. Rub gently, using a soft, non-fibrous rag. Always rinse the outside and dry it thoroughly. Do not use harsh chemicals or chemicals not compatible with food preparation or cooking. Each time you finish grilling, always let the parts cool thoroughly before you clean. Follow the cleaning directions as best you can after each grilling session. Staying on top of keeping your grill clean is half the battle. Letting it go can lead to a lot of surprises in the summer. Some of them can be of the four-legged variety, so get rid of as much food residue as possible and always keep the lid tightly secured. We hope you have plenty of fun filled Summer Grilling days!